The staff at the venue in Pokljuka were very accommodating, and excavated (half of) their range from under the snowbank for us. It snowed over 3′ the day before we arrived and then averaged about 1.5′ per day while we were there. The snow removal operation was something to behold: imagine snow-blowing a strip of your driveway, turning around and starting from scratch. Now imagine snow so deep that you have to hoist the snow-blower onto the pile of snow and blow the top half of the snow off before you can get to the bottom layer. Last Saturday we thew together a race with some Slovenians, Russians and Australians, and then we did a time trial amongst ourselves Sunday. The most snow I’ve ever seen. My race today in the 12.5k mass start was characterized by wet, warm, SLOW snow, wind, and bad shooting. I shot (2p, 3p, 3s, 1s). I was disappointed in the prone shooting because I know I can do much better than that, but for some reason I was wobbly today. Maybe my position, or maybe the wind. Tomorrow I am doing a 15k individual, which is the race format with a one-minute time penalty added for each miss instead of penalty laps. I am relieved to not have to enter the penalty lap after I skied almost 14k in today’s 12.5k, but a MINUTE penalty for each miss is much more brutal! I meant to do a blog post while I was still in Europe about my races at U23’s, but it turned out that the internet where we were staying in Norway was barely a crawl so I decided to just hold on until I was back in the states to fill everyone in! The difference in weather between our pre-camp in Toblach and the championships in Val di Fiemme could not have been more pronounced. The first couple days were nice, and then we got 3 feet of snow that quickly turned to at least the same amount of rain (sound like New England, anyone?) Needless to say, racing became very challenging and waxing a little tough. Luckily we had the best techs ever, and they just kept nailing the skis for everyone. It was a good reminder that championships don’t always happen on the sunny, hard pack days, and sometimes you have to battle through a little toughness. Nowhere is this more apparent than in Sochi right now, where it sounds like things have gotten tropical! Anyways, I didn’t have my best races but it was a reminder of how strong the competition can be at U23’s. I was really hoping to qualify in the sprint but I don’t think I was prepared to hammer the first (and really only) hill of the course. I think I skied the second half really well but I ended my day in 39th, just 3 seconds out of qualifying. It was super frustrating, but I tried not to dwell on it too much and instead to celebrate my teammates’ successes! Annie Pokorny really impressed me, qualifying in 28th and then staying in the mix up the first hill with some serious sprinters. Then of course there was Jessie who took second but skied every heat in the most ballsy way possible. It was so fun to have her with the crew if only for a few days. I had a bit of a break before the skiathlon so I got a few training (and cheering!) days. I started feeling a little bit low on energy during these days, and for whatever reason just didn’t have it for the race. I ended up 41st after skiing most of the race alone, in super soft and slow conditions. I was able to race the classic portion with Mary Rose, and I have to say, although I never saw a split, I really think we nailed the transition (gotta focus on some positives here!) Then over the next few days, I found out why I was feeling tired as I came down with a nasty cold. I was planning to do three races the next weekend at a Scandinavian Cup in Meraker, Norway, and though I did my best to recover and pound the Vitamin C, I was still feeling pretty congested for the weekend. So, I ended up only doing a sprint qualifier and instead watching most of the races. 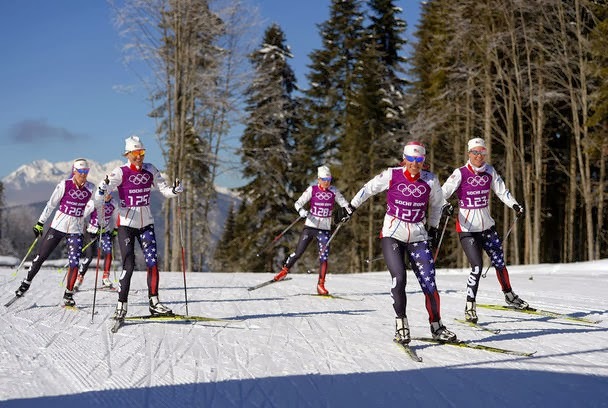 The 20k classic mass start was really fun to watch and the American girls’ team of Annie, Mary, and Katharine Odgen had a really good day. Wish I could have been there with them, but as my good friend Anya Bean says, some days you eat the bear, and some days the bear eats you. I’m back in Craftsbury now and the skiing here is pretty unreal, probably the best out of anywhere I’ve skied all season. So I have lots of motivation to get all the way healthy and ready to race again. I’ll be flying out to do the Birkie in just over a week, and since this will be my first Birkie I am super excited! Then I’ll be joining my teammates Pat and Caitlin on the OPA trip to Slovenia and Italy and I’m really hoping that this time I can use the things I learned from U23’s to have some successful European races. 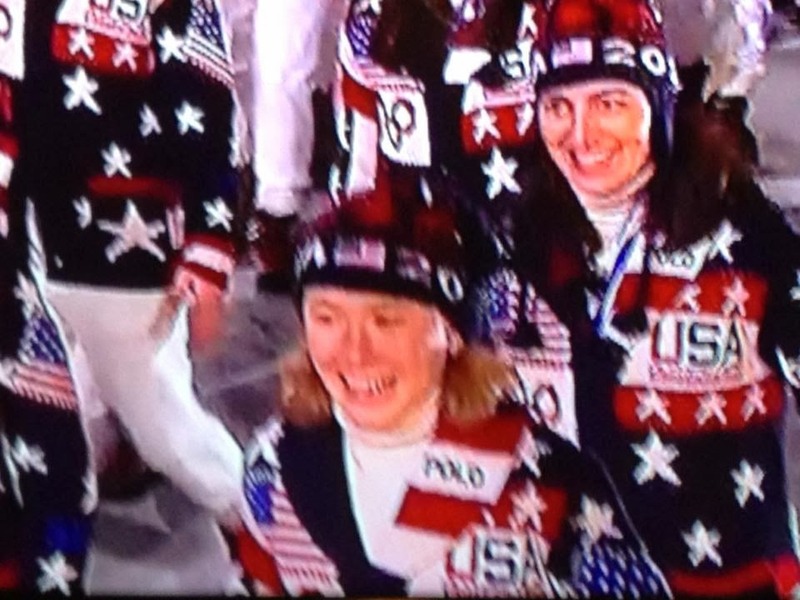 The competition is fast, but so are the Americans and I just keep getting pumped up from watching the Olympic races. Anyways, thanks for reading if you made it all the way through that, and here are some pictures from the trip to reward you! I did a terrible job of taking pictures in Norway so many are from the lovely Annie Pokorny, thanks Annie! It was great to have Steve Fuller from Flying Point Road Photography in Italy snapping some pics of the races. This one is from my sprint qualifier. U23 Women’s Sprint Podium, Jessie Diggins far left with the silver. Watching the men’s skiathlon with the U23 ladies and Mike Matteson, the head wax tech. The boys did great, with Scott Patterson in 18th and Ben Lustgarden 34th! 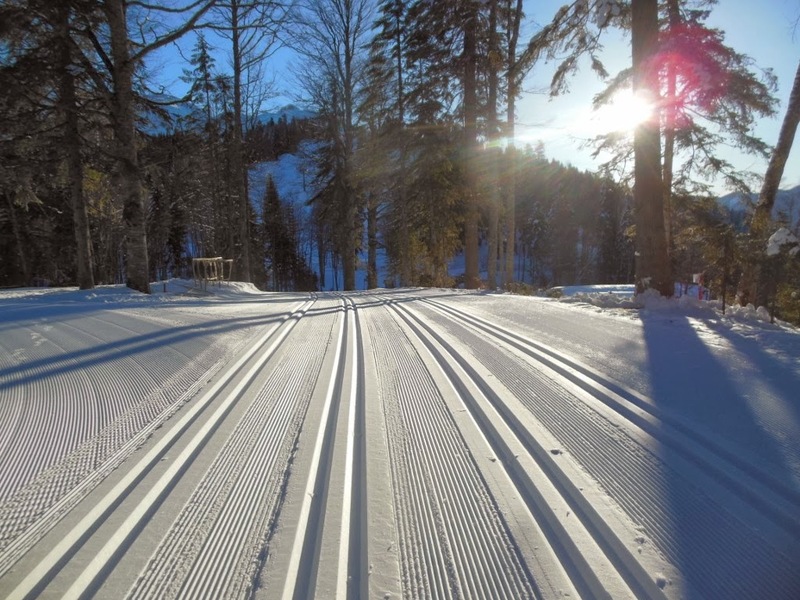 The ski scene in Meraker, Norway, hometown of Norwegian star Petter Northug. Oh, I also had a birthday on the road, and I think everyone was pretty psyched about it because of this amazing cake our Norwegian host Hanna whipped up! Skiing is a HUGE deal in Norway. 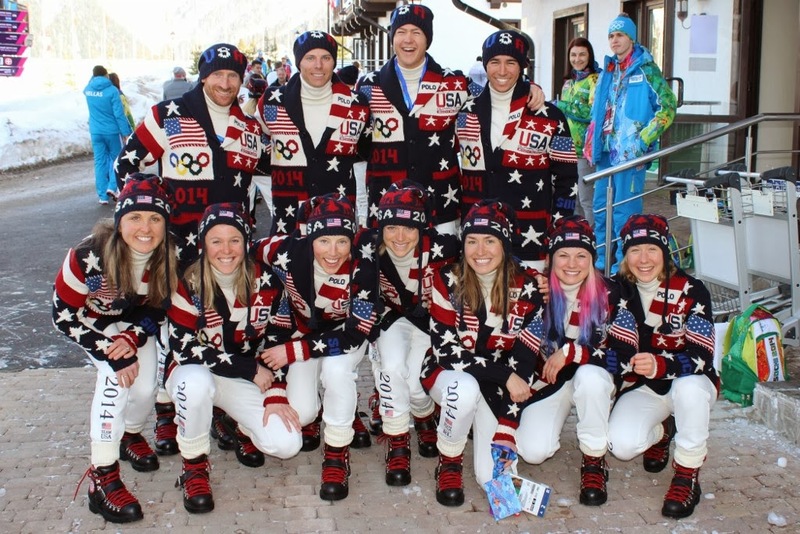 Here’s the group gathered at the ski lodge in Meraker to watch the men’s Olympic skiathlon. For perspective, there was actually a race going on outside while this picture was taken. Then they showed the race about 3 more times on television that day. Just a couple of pink marshmallows hanging out on the trails in Norway! 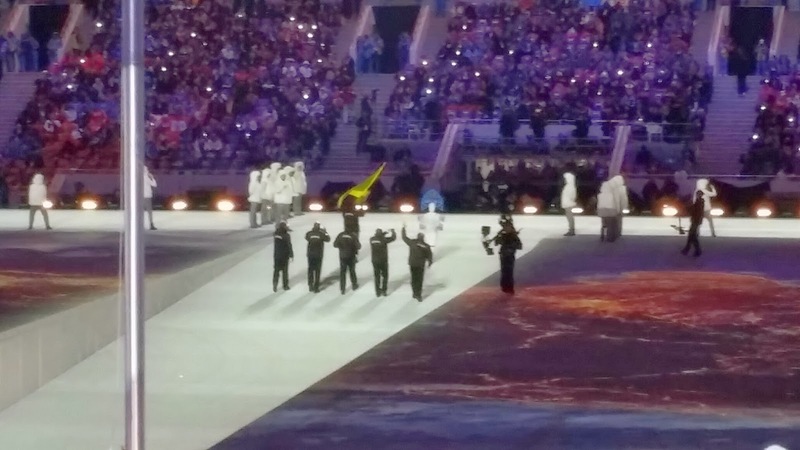 For a long time, I’ve tried to imagine what it would feel like to walk with Team USA into an opening ceremonies, to conjure in my mind the sights, sounds, and emotions that I would feel. Finally two nights ago, I had that chance and the experience blew away any hopes or expectations. Even with the tightest and itchiest turtleneck around my neck, the goosebumps were chilling. I still have not found the words to describe the how unbelievable it was but I will cherish the memories of holding on to my teammates Sophie and Jessie as the three of us screamed, jumped, danced, and laughed in a burst of happiness, shock, excitement, elation, tears and more. Even a sweater that we once considered laughable has now become my favorite piece of apparel. 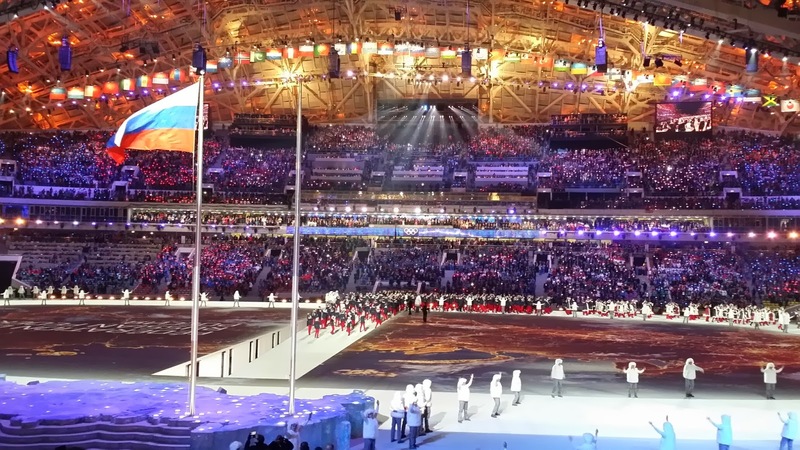 Without any knowledge of the Russian alphabet, we couldn’t understand the order in which the countries marched which just added to the excitement watching each new country emerge into the special stadium which was designed specifically for these ceremonies, and then join the other countries, adding to the cheering and energy filling the space. “Hot Cool Yours! Hot Cool Yours,” the motto of these games rang loud and clear, chanted in unison as the lights flashed and music blared, bringing everyone together. And when the Russians walked out the sound of the cheering was deafening, and my excitement and joy reached a new level. The 2014 Games are less than 48 hours old but it has already been an indescribable experience. I feel very lucky to be in Sochi with my teammates and coaches and to have such wonderful support from friends and family at home. And most importantly, I am very excited to compete for Team USA and officially become an Olympian. My racing starts this week on Tuesday with the freestyle sprint and then again on Thursday with the 10km Classic. Perfect ski conditions every day so far! 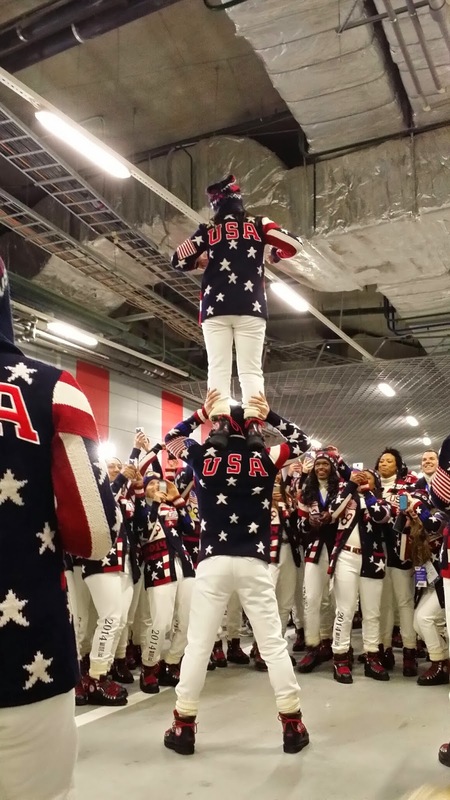 Team USA athletes showing their skills while we waited for the ceremonies to begin. A little TV time on NBC! It was so fun to hear from everyone who was watching from home. The outpouring of community support has been unbelievable. Thank you all! Looking forward to these next couple weeks of racing with this incredible team! Watching Susan and Hannah in their first race right now and I must say I’m more nervous than for most of my races! Go GRP!